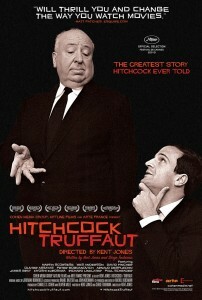 Hitchcock/Truffaut is a documentary film for all movie buffs that have ever considered magnifying their knowledge of the components in filmmaking. The film was so popular at the Cannes Film Festival this year that another screening was added to accommodate filmgoers. 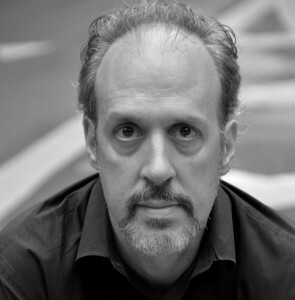 Kent Jones, the film’s director, is a notable film criticism writer, film historian, and artistic director of the World Cinema Foundation. Recently, he was in Chicago to promote the film at the Chicago International Film Festival. 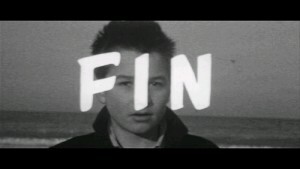 Jones’s film is based on the 1967 book Hitchcock/Truffaut, by French filmmaker, Francois Truffaut. It illuminates not only the famous interviews between the two filmmakers, but adds in-depth commentary by the world’s leading contemporary directors: Martin Scorsese, David Fincher, Arnaud Desplechin, Kiyoshi Kurosawa, Wes Anderson, James Gray, Olivier Assayas, Richard Linklater, Peter Bogdanovich, and Paul Schrader. 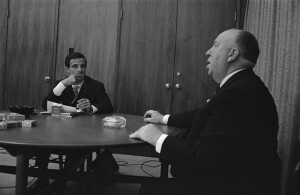 Truffaut, a successful French filmmaker, admired Hitchcock’s films, but on the same hand, he recognized that people knew very little about his techniques or his personal reasoning about the films. 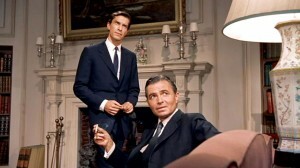 In 1962, he wrote a flattering letter to Hitchcock in which he invited him for an opportunity to be interviewed in a series of daily, week-long interviews. Tony Gemignani, San Francisco’s Pizza Champion, intentionally wrote The Pizza Bible in 2014. However, Francois Truffaut’s “Hitchbook” as he called it is known today as the ‘Bible on filmmaking’. 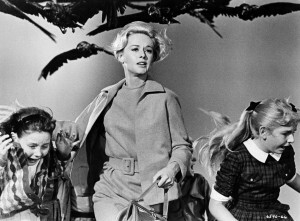 As an avid “Hitchcock” enthusiast, you can imagine my delight in not only viewing the film – three times to be exact – but having the opportunity to interview the writer and film’s director Kent Jones. We spoke via phone on October 26, 2015. The legendary Hitchcock and Truffaut interviews began the day of Alfred Hitchcock’s sixty-second birthday, which appeared to me as to be somewhat of a self-gift for Hitchcock. 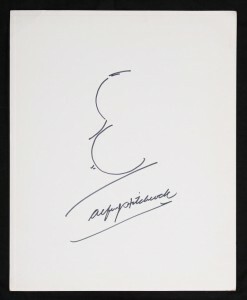 Were the Hitchcock/Truffaut interviews a birthday gift Alfred Hitchcock gave to himself? “Then, I think in the 50s, I don’t know how much exposure he had, but I think that he collected every word that was ever written about him. I’m sure that he knew what was going on in France in terms of filmmaking. And, I think having met Truffaut and the thought of him as a filmmaker, as opposed to a critic, was the catch. “And…not just any filmmaker, but a filmmaker who really, at that point, had already been established as this international superstar for making a very different kind of movie. Were you surprised by any aspects of the Hitchcock/Truffaut book or the audiotapes? “Well, I don’t know about, ‘surprised’ in the book. I mean, it’s a book that I got when I was twelve years old. In the tapes … I don’t know if I’m surprised, but I’m struck by the fact that Hitchcock doesn’t like to argue. 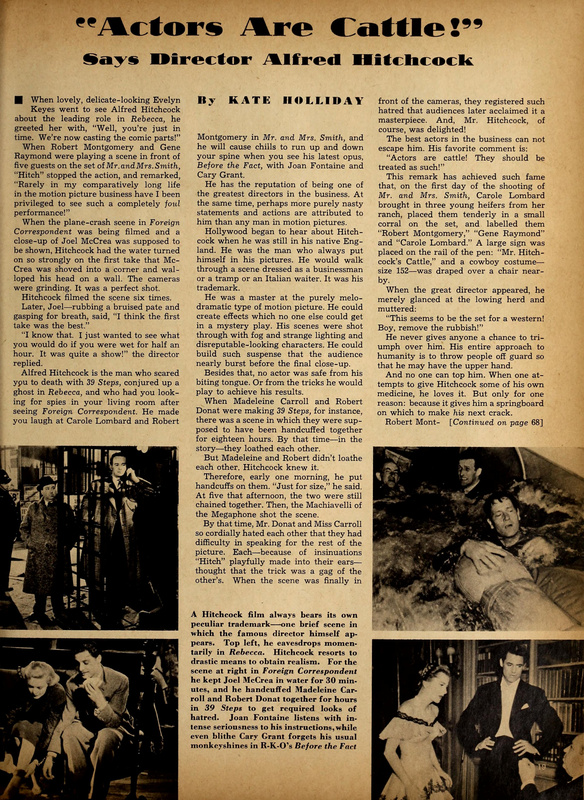 And so whenever Truffaut would bring up something that was sort of like a challenge, like his opinion about The Wrong Man, Truffaut just said, ‘I don’t think it’s really a great movie because it’s the wrong kind of material for you’ and, ‘It would have been better…It’s got a lot of great scenes in it. Of course you’re a great director, but it’s antithetical to your approach,’ and, ‘Documentary is antithetical to cinema, itself’ and endlessly, on and on and on. “At a certain point, he just kind of goes very quiet about that. An incredible discovery, to be sure, which led perfectly to my next question about the tapes. Speaking of the tapes, how did you come by them? Are they public record? “Well, you can get a ten-and-a-half-hour, or an eleven-and-a-half-hour, kind of reduced version, created for French radio by Serge Toubiana, who co-wrote the movie. If you go online to the Truffaut page, you’ll also find them. “It’s on the Internet archives, the whole twenty-seven hours. Just hit the ‘cinema tech,’ and there’s a copy of the academy film archive. 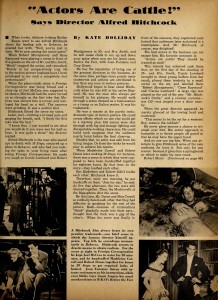 The quote “Actors are Cattle” first appeared in an article by Kate Holiday in the 1941 Hollywood Magazine page 18. Now that we’ve had our Hitchcock “direction style” lesson for today, let’s all sit back and decide which of his sixty-nine movies we may want to watch, having gained new insight. Hitchcock IMDB (Internet Movie Data Base) — There are 69 films which Hitchcock has directing credit.